For 2018, IGX continues its tradition of supporting ongoing HEMA tournament formats while piloting new formats. This year, the Longsword and Mixed Weapons tournaments are getting a facelift! No more modified Nordic rules, no more 7 staff per ring…it’s going to be epic. For Dagger, we will continue with the same rule set you saw in 2017, but with some slight modifications. Details are still being worked out, so check back often for the latest updates.have taken the feedback received from last year’s tournament and have made changes that we hope participants will enjoy. We are also once again hosting a Cutting tournament, under the leadership of Andrew Kilgore from Athena School of Arms. We are also continuing to encourage the growth of Women’s participation in HEMA and are offering Women’s tournaments in Longsword and Mixed Weapon. The hugely successful Wisdom League is making its return as well, designed to encourage the growth of tournament participation by HEMA practitioners 50+. Dagger: Fighters will participate by weight class, and will fight using a customized IGX dagger ruleset. This is an Open event. Cap of roughly 20 fighters. Mixed Weapon: Fighters will use the new “Hit Points” rule set with a wide array of single-handed swords (steel preferred, nylon may be allowed if no steel equivalents are available). This is an Open event, but will have a Wisdom and Women’s track if there is enough interest. Cap of roughly 30 fighters. 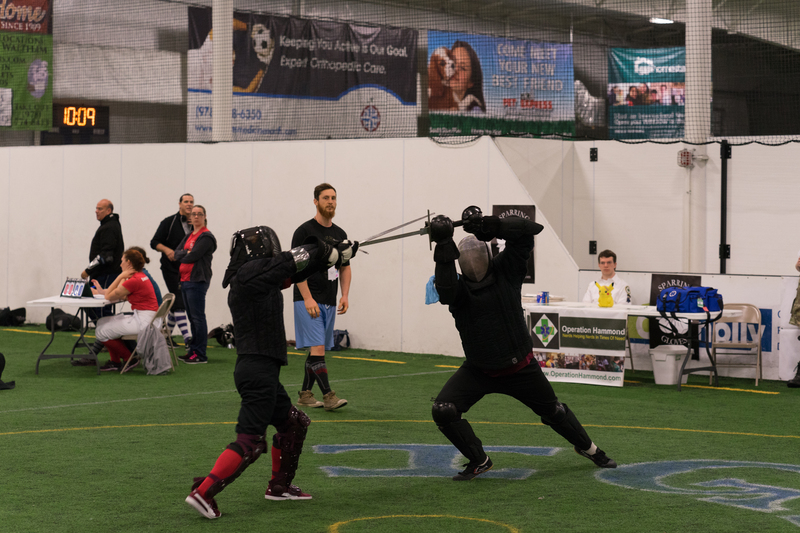 Open Longsword: Typically the golden standard of HEMA competition, this event format will feature steel longswords with the new “Hit Points” rule set. To help raise the bar for both competitors AND judges, fighters should expect to be asked to judge at some point. This is an Open event, but will have a Wisdom and Women’s track if there is enough interest. Fighters competing in this event may not compete in the Beginner Longsword tournament. Cap of roughly 50 fighters. Beginner Longsword: Because the goal of this tournament is to help expose newer HEMA practitioners to longsword competition, this event is separate from the Open Longsword tournament, but will use the “Hit Points” rule set. Fighters will get more feedback from both coaches and officials to help develop competitive HEMA skills. Fighters competing in this event may not compete in the Open Longsword tournament. Cap of roughly 30 fighters. Youth Longsword: Start ’em young! The goal of this tournament is to help expose our youngest HEMA practitioners to longsword competition. The rules will be the same as the other Longsword tournaments. Fighters will get more feedback from both coaches and officials to help develop competitive HEMA skills. Cutting Tournament: This skills competition will feature innovations from other cutting tournaments around the country and continue some of the unique elements of the IGX event. Our focus remains on challenging the competitors to demonstrate cutting skills in applications more like cutting in combat, including movement, measure, and reaction based feats. Basic Qualifications will also be included. Expect to have a coach! IGX highly recommends all competitors to have a coach in their corner, to help both with bouting feedback and as a potential go-between with tournament staff. If you need a coach, please speak with one of the IGX staff and we will do what we can to ensure you have one. Expect to judge! Judging in HEMA takes practice, and there is no better learning environment than a live tournament. Learning how to judge not only helps increase the pool of experienced judges in the HEMA community (a constant need), but also helps all fighters gain a better appreciation of what is (and isn’t) reasonable for judges to see in a bout. This year, all clubs participating in tournaments should expect to “donate” a number of their participating fighters as judges; tournament scheduling will be structured so that this will be possible without affecting their tournament participation.